Last Thursday night at the Outsound New Music Summit, musicians and music lovers came together to celebrate the life and legacy of one of our own, Ralph Carney. He was a fixture of the Bay Area new-music scene who could be spotted performing in many groups and venues, and he also enjoyed success and notoriety in popular music with Tom Waits, the B-52s, and others. He is also one of the most infamously colorful characters in the scene. He passed away suddenly at the end of 2017 in an accident, leaving many both shocked and saddened. 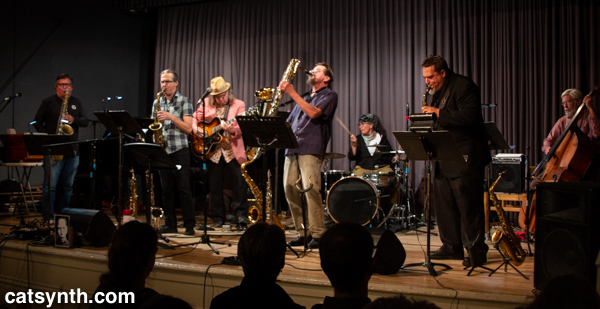 This tribute concert featured a performance by Rubber City, of which Ralph was a member, and a memorial ensemble featuring local musicians who performed his compositions. 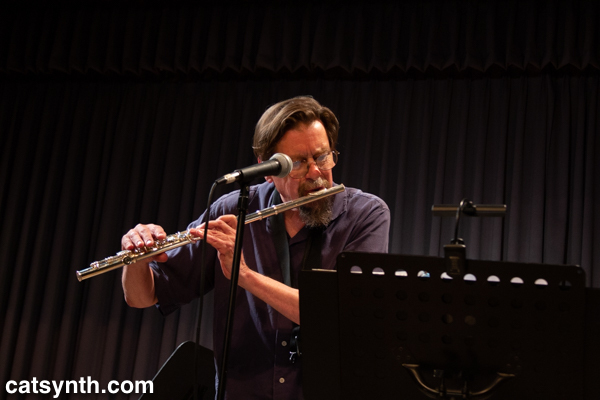 In the week leading up the concert, we had the chance to speak with David Slusser of Rubber City and Phillip Greenlief, who arranged Carney’s music for the memorial ensemble. You can hear from them in these videos. Rubber City opened the evening with a rendition of Beautiful Ohio, sounding much like they did in the video. It was a fitting opening as Slusser, Carney, and drummer Chris Ackerman were all Ohio expatriates. 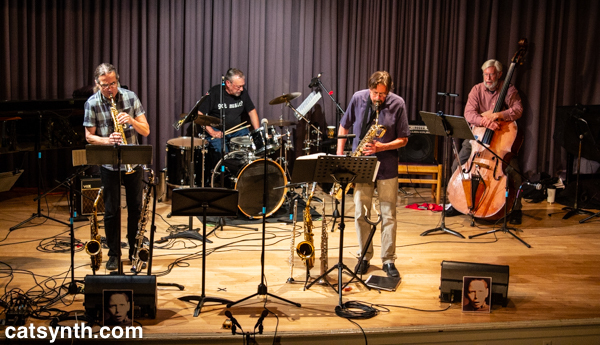 They were joined by bassist Richard Saunders and reedist Sheldon Brown. The second piece, a rather bluesy tune, also evoked their Ohio origins and gave Saunders and Brown a chance to shine in solos. The next was much darker and more atonal/arhythmic in nature but still had a very playful quality to it. 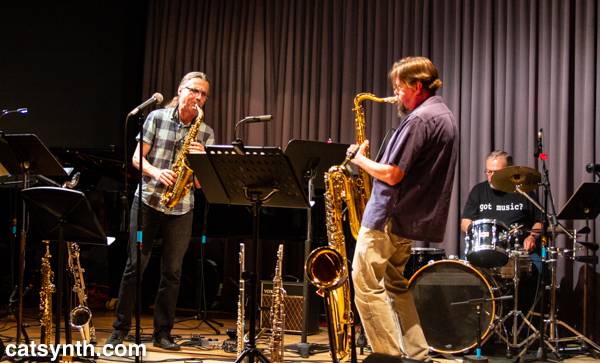 Another featured Slusser and Brown both playing soprano saxophone at the same time, a rare combination! For the last piece, they set aside the saxophones for bass clarinet and flute. Even during moments of seriousness, there was a lot of fun and energy in the music, which was fitting for the artists on stage as well as the one they were paying tribute to. It was a tremendous performance overall, and one I am not likely to hear repeated soon. The group began on a somber note with Carney’s Lament for Charleston, written shortly after the massacre at the Emanuel AME Church in Charleston, South Carolina in 2015. But even this dark piece had exuberance and could not fully contain the energy of the large group. From there, they continued on a rollicking trip through Carney’s compositions, including his oddball marches and an old-timey song about driving down Sunset Boulevard in Los Angeles that was sung by Greenlief with great effect. 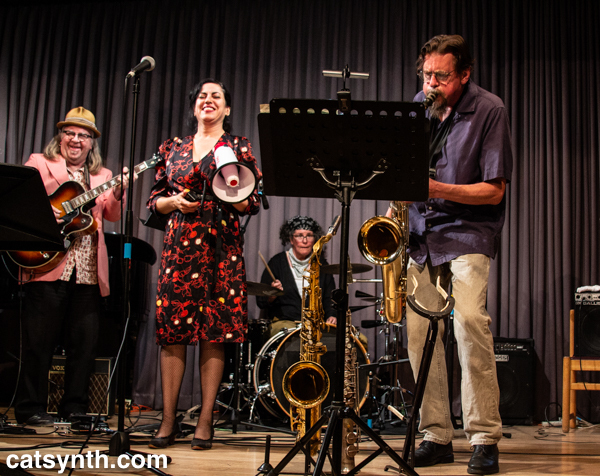 In keeping with Ralph Carney’s wide-ranging musical interests, there were a number of vintage jazz-style and mid-century tunes complete with swaying horn-section choreography. Karina Denike’s singing and vintage presentation added to the overall effect and classic style of the performance. Many of us were simply caught up in the joy of the music and the celebration. Upon reflection, one realizes how different this was from the typical Outsound set with its references to swing, bebop, and early rock-and-roll. But there is absolutely nothing wrong with that – I have long professed that “new” and “experimental” musicians should not feature traditional idioms and structures in their music. This was an unequivocally great show, and the fact that it was on the Outsound stage was all the better. Both bands played to a full and very appreciative house. Throughout the evening, on stage and in the audience, people shared their memories of seeing Ralph play or performing with him, and how much he is missed. I am confident that he would have loved our musical tribute and celebration, though he probably would have expressed his appreciation in an appropriately dry and confounding way. Just before departing for NAMM back in January, we had the opportunity to attend the SFJAZZ Gala honoring Zakih Hussain with a lifetime achievement award. One of the unexpected guests of the evening was a torrential rain that peaked just as we were arriving. This video from our Instagram gives a small taste. But inside it was warm, the drinks were flowing, the music was as expected. We had seats in the bleachers which provided an excellent view of the stage. And the backs of the musicians, including the maestro himself. You can see a much better view of Zakir Hussain performing with saxophonist John Handy is the Instagram photo from SFJAZZ. 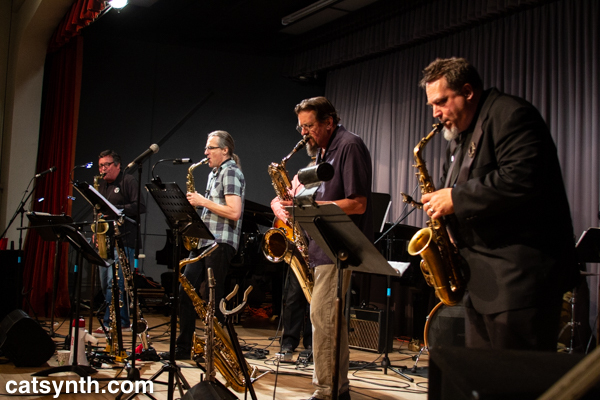 It was a sweet and delightfully simple jam, which capped an evening of performances featuring the SFJazz Collective, saxophonists Joe Lovano and Joshua Redman, guitarist Bill Frisell, vocalist Mary Stallings, trumpeter Terence Blanchard, and drummer Cindy Blackman-Santana. After the presentation, it was time to party, with more music and dancing filling the hall. We didn’t stay too late because I was off to NAMM the next morning, but I am glad to have braved the storm to celebrate a great musician. It’s been five days since Luna left us. I am still having a hard time processing that she is gone. But I have been very touched and humbled by the outpouring of love for her and sympathy for us. There have been a few tribute posts as well, and we share them below. The Cat Blogosphere has long posted memorials for blogging cats when they pass away. We have shared a few of those over the years on this site. This time we were on the receiving end, with this beautiful graphic and a very sweet post. Luna is an icon of the Cat Blogosphere, and will be sorely missed. Fly free, sweet girl. Our friends Elvira, Kiril, Sneakers, Friday and Nikita at Opinionated Pussycat have dedicated a full post to Luna. The beauty and grace of Luna so finely complimented the beauty and grace of the instruments her human blogged about and the music and art her human created and shared (the photo above is from 2010). Her presence complimented perfectly the contributions CatSynth made, as frequent contributor and host, to 3 of the earliest and best of the pet blogging share fests, all about cats, Carnival of the Cats, Weekend Cat Blogging, and Bad Kitty Cats Festival of Chaos, for many years, beginning in the summer of 2007…CatSynth first hosted CoTC with #189. Music & art shows, travel, photography, cats, synthesizers, sass and grace. And finally, our dear friend and supporter at matrixsynth have a post for Luna. Certain pets more so than others. JD was one of them, and I know Luna was as well. They let you become who you want to be. They are your confidante in life. Loosing them feels like loosing a part of yourself. Luna will not only be missed by her owner and friend Amanda, but by those of us that have enjoyed her virtual company online through numerous posts on CatSynth, and a few here on MATRIXSYNTH. We will never forget you Luna! A tribute to Ornette Coleman from J.B. of the Mensa Cats. Click here to subscribe. You can also visit the CatSynth Channel page for more info or to listen live. We will have another related video treat for our readers and listeners this Wednesday. These recordings were released on the Internet Archive, as part of a Creative Commons release. A technical note: classical recordings tend to suffer more from the artifacts of MP3 encoding, and these recordings have been through the MP3 machine at least twice if not more. Those who want to hear a cleaner version are encouraged to check out the source version, or an original recording on CD. This pattern, and indeed the generally “modal” nature of the music in this act, is presumably to give the music an “eastern” flavor, in keeping with the story of Turandot. However, it fits perfectly in with my own interests in more mainstream music, including my current fascination with old R&B and rock-and-roll from the 1950s and 1960s. One could see the above pattern, performed by the low strings of the orchestra, done by a string bass in an old jazz or R&B recording . Keeping with our recognition of the 2nd anniversary of Katrina, we present another selection from the album Requiems for a Submerged City, “An electronic tribute to the City of New Orleans and its people – to those who survived Katrina and to those who didn't.” The album is released via the great Internet Archive. KraftiM's track is a personal, loving tribute to the soul of New Orleans, pulsating with rhythms and echoes of the sweet soul music he once grew to love. Sounds of wind and water mix to this carnival-like electronic potpourri as a natural part of the environment and its atmosphere, but at the same time casting a dark shadow over the passionate and creative spirit of the city and its soul. In addition to being a tribute, this is a great album musically that would strongly recommend for anyone who appreciates electronic music. I am also going to try and find other releases by the artists who participated. From today's New York Times, news of the death of filmmaker Ingmar Bergman. Ingmar Bergman, the ?poet with the camera? who is considered one of the greatest directors in motion picture history, died today on the small island of Faro where he lived on the Baltic coast of Sweden, Astrid Soderbergh Widding, president of The Ingmar Bergman Foundation, said. Bergman was 89. Although “Persona” wasn't even mentioned in the New York Times tribute, it is considered by many, including myself, to be his best.